Objectives Hypertension is well established as a major risk factor for cardiovascular disease. Although there is undeniable evidence to support the beneficial effects of antihypertensive therapy on morbidity and mortality, adequate blood pressure management still remains suboptimal. Research into the treatment of hypertension has produced a multitude of drug classes with different efficacy profiles. These agents include β-blockers, diuretics, ACE inhibitors, angiotensin receptor blockers and calcium channel blockers. One of the oldest groups of antihypertensives, the calcium channel blockers are a heterogeneous group of medications. Methods This review paper will focus on amlodipine, a dihydropyridine calcium channel blockers, which has been widely used for 2 decades. Results Amlodipine has good efficacy and safety, in addition to strong evidence from large randomised controlled trials for cardiovascular event reduction. Conclusions Amlodipine should be considered a first-line antihypertensive agent. It is well known that many antihypertensive medications reduce the risk of stroke and heart attack. This is generally believed to be a class effect however. This review paper focusing on amlodipine showing how its unique properties may provide enhanced cardiovascular protections compared with other antihypertensive agents. This paper sheds light on the evidence in support of amlodipine as a first-line antihypertensive agent for the prevention of strokes in particular. Calcium channel blockers (CCBs) were first introduced over 35 years ago initially for coronary heart disease (CHD), but they soon gained wide recognition for their efficacy in hypertension (HTN). The initial indication, besides HTN, also included angina, peripheral vascular disease and some arrhythmic conditions.1 Amlodipine has many unique qualities that set it apart from other agents in this class. The aim of this review is to compare amlodipine with other antihypertensive agents with particular focus on the ability to improve cardiovascular (CV) health and reduce adverse CV outcomes. The most commonly reported adverse effect hindering compliance with amlodipine is peripheral oedema. However, this adverse effect can be minimised if the agent is given at bedtime, and lower doses (2.5 or 5 mg/day) are used. Indeed, the bedtime administration of nifedipine gastrointestinal therapeutic system was associated with a 93% reduction in oedema compared with morning dosing (1% vs 13%, p<0.001, respectively).4 Other reported side effects include dizziness, fatigue, headache, palpitations and nausea, although these are generally not bothersome enough to cause discontinuation of the drug. Amlodipine is contraindicated in breastfeeding women, cardiogenic shock and unstable angina. Also, its vasodilatory effect can lead to decreased cardiac output in the setting of aortic stenosis. Several HTN trials have investigated the efficacy of amlodipine monotherapy versus other agents, including diuretics, ACE inhibitors (ACEIs) and angiotensin receptor blockers (ARBs). The outcomes of these trials suggest that amlodipine has a neutral effect on several pre-existing comorbid states, which will be discussed below. The beneficial effects of amlodipine go beyond calcium channel blockade for HTN management. Although many of these trials show that amlodipine is not superior to other agents in preventing CAD, it can be safely used in patients with CAD for the management of HTN. While thus far amlodipine has shown to be non-inferior to many other anti-HTN therapies, the focus on HTN treatment seems to be shifting more towards combination therapy. Less than 50% of patients with stage I or II HTN are adequately controlled with monotherapy, and thus initial treatment for HTN in the majority of patients will require two agents. The classical approach to treating HTN where one first-line agent is maximised before another is added may be flawed since this is a multifactorial disease often occurring with a number of comorbidities. Many studies show that individuals with more CV risk factors generally need more anti-HTN agents to successfully manage their BP. Combination therapy using different mechanisms can lead to more effective BP lowering. In addition, combination therapies block counter-regulatory mechanisms that often limit the efficacy of monotherapy. Furthermore, using multiple agents to lower doses may reduce side effects, and thus improve patient compliance. The issue arises as to which fixed combinations provide the most benefits. Thiazides in combination with ACEIs or ARBs have synergistic BP-lowering activity, whereas thiazides and BBs have deleterious effects on the metabolic profile. CCBs are powerful vasodilators but can result in renin–angiotensin–aldosterone system (RAAS) activation, thus an ACEI or ARB counteracts this mechanism and leads to enhanced antihypertensive effect. Growing evidence from trial data also shows that CCBs with ACEIs or ARBs may provide the best long-term outcomes. 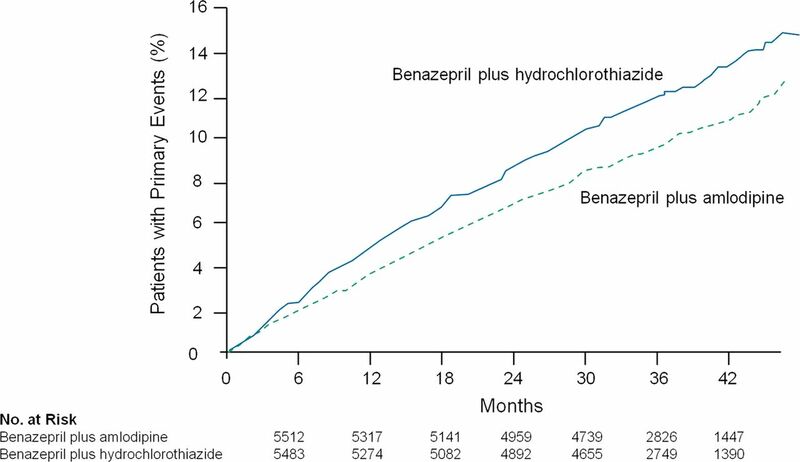 ASCOT: randomised trial showing a decrease in cardiovascular mortality in patients treated with amlodipine/perindopril compared with atenolol/thiazide therapy.37 ASCOT, Anglo-Scandinavian Cardiac Outcomes Trial; CV, cardiovascular; RRR, relative risk reduction. Amlodipine is an excellent first-line choice among the myriad options of antihypertensive agents. In the studies discussed in this manuscript, amlodipine was highly effective for the treatment of HTN and stable angina as evidenced by the fewer hospitalisations for unstable angina and revascularisation in randomised controlled trials. Amlodipine has also shown robust reductions on CV end points (especially stroke) but has not altered the prognosis in HF. Its abilities to prevent activation of counter-regulatory mechanisms, to slow the progression of atherosclerosis, to confer antioxidant properties and to enhance NO production are all unique actions. The management of HTN is shifting more towards dual or even triple combination therapy and requires a patient profiling approach as the number of comorbid states increases. Amlodipine is a superior option in the HTN armamentarium, not only for controlling BP but also for safely improving patient outcomes.
. Effect of antihypertensive agents on cardiovascular events in patients with coronary disease and normal blood pressure: the CAMELOT study: a randomized controlled trial. JAMA 2004;292:2217–25. The ALLHAT Officers and Coordinators for the ALLHAT Collaborative Research Group. Major outcomes in high-risk hypertensive patients randomized to angiotensin-converting enzyme inhibitor or calcium channel blocker vs diuretic: the Antihypertensive and Lipid-Lowering Treatment to Prevent Heart Attack Trial (ALLHAT). JAMA 2002;288:2981–97.
. Calcium channel blockades exhibit anti-inflammatory and antioxidative effects by augmentation of endothelial nitric oxide synthase and the inhibition of angiotensin converting enzyme in the N(G)-nitro-L-arginine methyl ester-induced hypertensive rat aorta: vasoprotective effects beyond the blood pressure-lowering effects of amlodipine and manidipine. Hypertens Res 2005;28:689–700.
. Effects of amlodipine on gene expression and extracellular matrix formation in human vascular smooth muscle cells and fibroblasts: implications for vascular protection. Int J Cardiol 1997;62(Suppl 2):S31–7.
. Reducing readmissions for congestive heart failure. Am Fam Physician 2001;63:1593–8.
. Effect of amlodipine on mode of death among patients with advanced heart failure in the PRAISE trial. Prospective Randomized Amlodipine Survival Evaluation. Am J Cardiol 1998;82:881–7.
. Prevention of cardiovascular events with an antihypertensive regimen of amlodipine adding perindopril as required versus atenolol adding bendroflumethiazide as required, in the Anglo-Scandinavian Cardiac Outcomes Trial-Blood Pressure Lowering Arm (ASCOT-BPLA): a multicentre randomised controlled trial. Lancet 2005;366:895–906.
. Optimizing combination therapy for cardiovascular protection: evidence from landmark trials. Medicographia 2013;35:455–63.
. The combination of olmesartan medoxomil and amlodipine besylate in controlling high blood pressure: COACH, a randomized, double-blind, placebo-controlled, 8-week factorial efficacy and safety study. Clin Ther 2008;30:587–604.
. Telmisartan and amlodipine single-pill combinations vs amlodipine monotherapy for superior blood pressure lowering and improved tolerability in patients with uncontrolled hypertension: results of the TEAMSTA-5 study. J Clin Hypertens (Greenwich) 2011;13:459–66. Contributors HF assisted with the gathering and review of the data; JJD, JHO and CJL reviewed the data; HF, JJD, JHO and CJL assisted in the concept and design of the manuscript. HF, JJD, JHO and CJL wrote, rewrote and finalised the manuscript. Funding This manuscript received no specific grant from any funding agency in the public, commercial, or not-for-profit sectors.